Instagram Shadowban - the invisible traffic block that’s stopping your content from being seen. Instagram Shadowban – the invisible traffic block that’s stopping your content from being seen. Have you noticed your follower numbers slowly decreasing, or maybe your likes seem to have dropped dramatically? Is your comment box a dead zone? You may be the victim of a shadowban. Not quite as dark as it sounds, but still pretty traumatic if you are trying to build an online business. Essentially, Instagram has banned you from appearing, but without letting you know that you have been blocked, hence the term shadowban. But why has this terrible fate befallen you, when you are merely trying to upload cute pictures of your puppy to share with the world? Instagram hasn’t openly stated why it’s shadowbanning or even formally acknowledged that it is. Most evidence comes from various web warriors exploring exactly why their Instagram numbers have gone down the pan. However, from what Instagram has officially said, we can safely state the following. Influencers are switching to Instagram stories in their hordes, with the platform proving increasingly popular as a marketing tool for both businesses and individuals. As with all platforms, Instagram works hard to ensure that its algorithm offers its users what it believes to be the most valuable content. With so many users and an increasing popularity pushing engagement, and ‘false’ engagement ever higher, Instagram struggles to manage what it believes to be spam content. They are currently trialling a system which crawls posts and marks those it believes to be inappropriate content. As the Instagram bots crawl posts, they will find consistencies between banned posts and the hashtags they use. This will lead them to either temporarily or permanently block the hashtag and anyone posting fresh content to it. If during this period, you use the hashtag, the system will recognise that you are posting ‘banned’ content and will flag it as inappropriate. Similarly, if you are displaying ‘suspicious’ activity, particularly the use of automated posting services, ‘buying’ likes and followers or over-tagging, your content will have been marked out. Your friends, followers, and yourself will also still be able to see your posts, but anyone who is looking through the ‘discover’ section or searching hashtags won’t be able to view your content. An example of a rumoured ‘flagged tag’ was the #dogsofinstagram – if you used this hashtagged during its downtime then your account may have received a shadowban. Anyone who searched for #dogsofinstagram or any of the other hashtags you used on the same post would not have been able to view your content. I think I may have been banned, how do I check? Put a new post up, with hashtags, and ask someone who does NOT follow you on Instagram to check the discover feed for your hashtag. 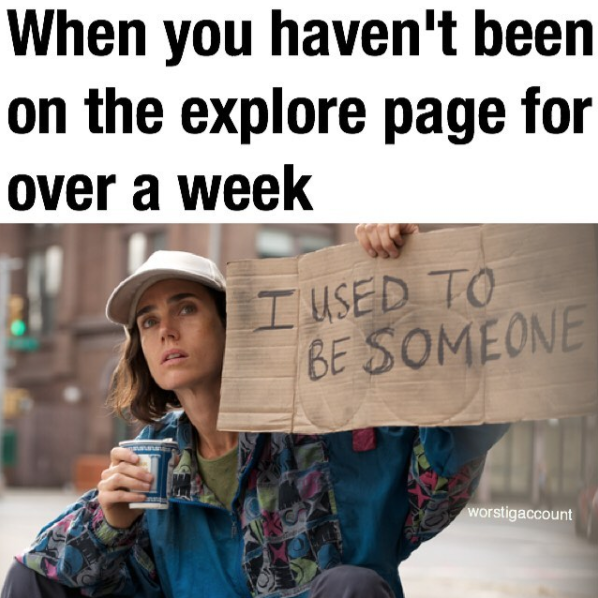 Your newly posted image should appear in the ‘Most Recent’ section. If not, you may have been shadowbanned. What can I do if I have been banned? There are a few recommended tips for anyone who has been shadowbanned. Firstly, if you are using any kind of automated service, particularly paying for likes and followers, stop immediately. Similarly, if you do anything that could be considered ‘robotic’ behaviour; going on a like and follow spree, following and then unfollowing multiple accounts or posting random comments (ever looked at a comment left by someone on a pictures of your dog which says ‘beautiful view!’ and thought… wait what? ), stop. Be a human and aim for true valuable engagement. Not only will this be a more honest way of interacting with the community, but it will also show Instagram that you are real! Still not working? It may be that you have seriously flagged up on the system, and you may need to consider an Insta-holiday. And not the kind where you can #hotdoglegs. Take a few days off from posting and relax your interactions with other accounts. What can I do to prevent being banned? Don’t use any kind of automatic liking/following app or site. Be careful with your hashtags; check them first before posting. You can look under the most recent section to see if it is flagging any current error with that hashtag. Likewise, don’t repeatedly use the same hashtags or over hashtag your posts. Keep it natural and related to your post each time. Not only are obscure hashtags more likely to not be tagged as spammy, they are also more likely to get you high-quality engagement. Like long tail keywords, they are highly specific to what a user is searching for! 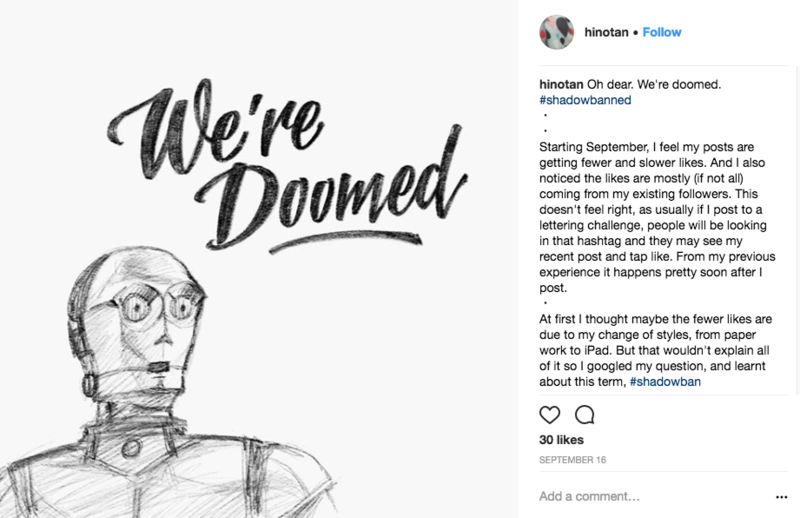 Have you suffered a #InstagramShadowban? Let us know your experience and whether you managed to escape! You can also give us a cheeky follow over @sleepinggiantmedia on Instagram.